KHOTANG, JULY 27: Three years after 2015's devastating earthquake, more than 2,000 quake victims from Khotang have received the second installment of the housing grant provided by the government. 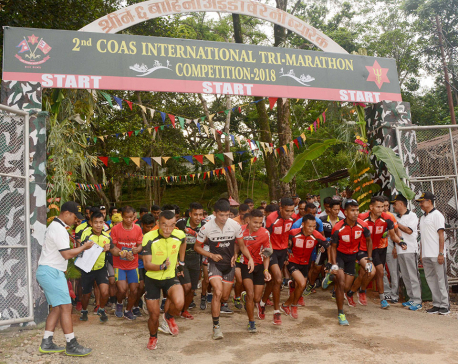 KATHMANDU, July 22: Tribhuvan Army Club Team A of the Nepal Army has won the title of 2nd CoAS International Tri-Marathon Contest 2075 by covering a 43.5-km distance in 2 hours 18 minutes and 49 seconds on Saturday. KATHMANDU, May 27: The Second Kathmandu Aksharaa International Children’s Theater Festival 2018 had its opening ceremony on Saturday on the premises of Aksharaa School, Kandaghari. 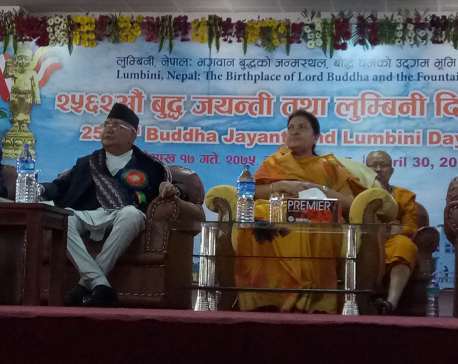 LUMBINI, April 30: President Bidya Devi Bhandari has inaugurated a program on the occasion of the 2562nd Buddha Jayanti extending best wishes to all those who believe in the message of peace, non-violence, harmony and co-existence of Gautam Buddha including to the Buddhist community. 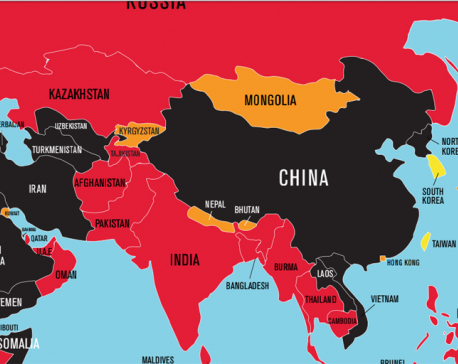 KATHMANDU, April 26: Nepal ranks second in South Asian countries in World Press Freedom Index of 2018. The World Press Freedom Index ranks 180 countries on indicators such as media independence, self-censorship, the rule of law, transparency and abuses. 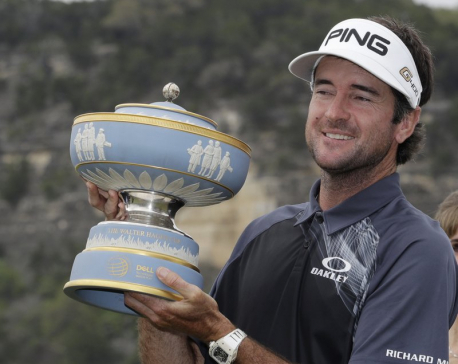 AUSTIN, March 26: Bubba Watson was in high spirits for someone with such low expectations at the Dell Technologies Match Play. KATHMANDU, March 22: The Youth and Women Groups of Jhiltung and Kolputar is set to organize the second Jhiltung Cross Country Race on Sunday. KATHMANDU, March 17: Bishal Milan Kendra has climbed to the second place defeating South Siders 70-61 in the ongoing first Kwiks Men’s Basketball League on Friday. ZIMBABWE, March 1: Nepal is taking on Hong Kong in the ICC World Cup Qualifiers warm-up match being held in Kwekwe Sports Club on Thursday. KATHMANDU Feb 9: The National Reconstruction Authority (NRA) has extended the deadline for the beneficiaries for taking the second instalment of the house construction grants until April 13, 2018. KATHMANDU, Feb 9: Tribhuvan University, Office of the Controller of Examinations has published the results of the three-year Bachelor Level Second Year examinations held in the month July. KATHMANDU, Feb 1: The Civil Aviation Authority of Nepal has brought second generation (2G) radar into operation officially from today. GORKHA, Jan 27: The CPN (Maoist Centre) leader Narayan Kaji Shrestha on Saturday said homework was being done to form the left alliance-led new government and unify the CPN-UML and the Maoist Center. 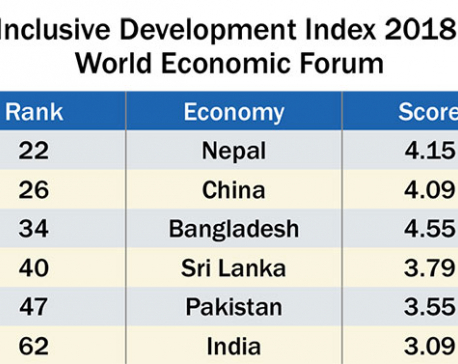 KATHMANDU, Jan 23: Nepal has inched up five notches to 22nd position in the 2018 Inclusive Development Index (IDI) of World Economic Forum (WEF) among 74 emerging economies. KATHMANDU, Jan 14: Tribhuvan University, office of the controller of examination, Balkhu has published the results of 4 Years Bachelor of Science (B.Sc) Second Year, today. ITAHARI, Jan 7: 42nd National Athletic Championship has begun at the Sports City Ground Ithari today. A total of 187 athletes are participating in the Championship. Nepal Athletics Association has organised the three-day Championship in coordination with Morang Athletics Association. MOUNT MAUNGANUI, New Zealand, Jan 1: The West Indies won the toss and chose to bowl Monday in the second Twenty20 cricket international against New Zealand at Bay Oval. BAJHANG, Dec 31: It might be hard for some to believe that it is very rare for people to find a toilet in Thalara Kholi, the second largest market of Bajhang, which is famous for the palace of Thalari king. 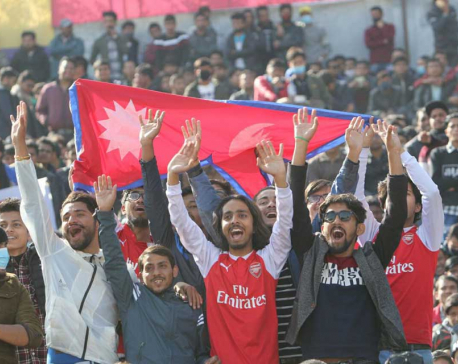 KATHMANDU, Dec 30 : Biratnagar Warriors has won the Everest Premier league (EPL) with Bhairawa Gladiators by one run in TU Cricket Ground, Kritipur on Saturday. 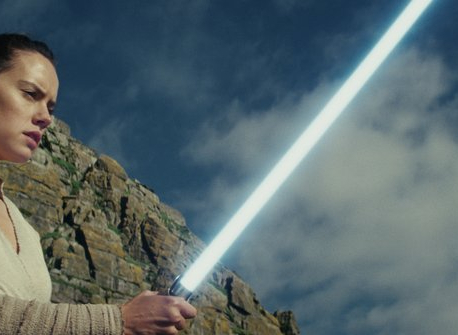 NEW YORK, Dec 18: “Star Wars: The Last Jedi” will happily settle for second. KATHMANDU, Dec 1: Prime Minister Sher Bahadur Deuba has extended best wishes for the happiness, peace and prosperity of all the Muslims on the occasion of the 1432nd birth anniversary of Hazrat Mohammad, the final rasul or messenger of the Islamic faith. KATHMANDU, Nov 4: Nepal U-19 ran out four Bangladesh U-19 batsmen to restrict them for 227 runs in 50 overs for the loss of eight wickets in the second practice match of the tour played at BKSP ground, Savar. 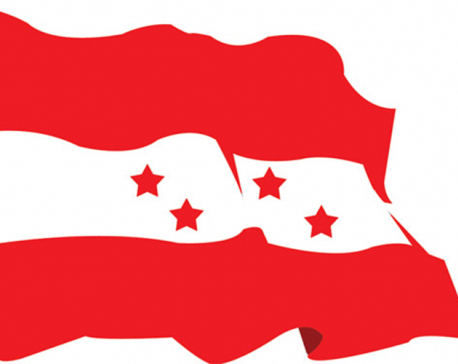 KATHMANDU, Nov 2: Nepali Congress (NC) has finalized the list of candidates for Parliamentary and Provincial elections. 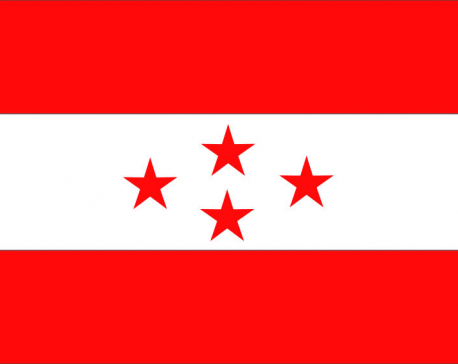 The NC made the final list public on the nomination day for the second phase of elections scheduled for December 6. KATHMANDU, Oct 30: The 32nd Academic Assembly of Nepal Academy kicked off here today to formulate annual policies, programmes and budget for the organization. 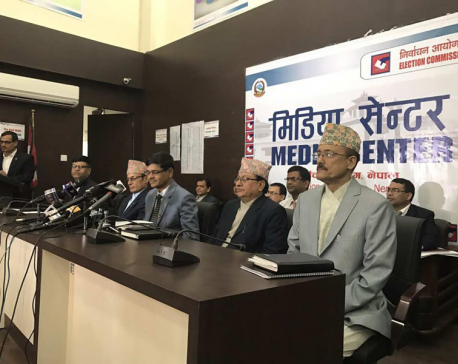 KATHMANDU, Oct 25: Nepali Congress (NC), the major ruling party, has intensified the discussions for selection of the candidates to contest the second round of elections to the House of Representatives and State Assemblies. 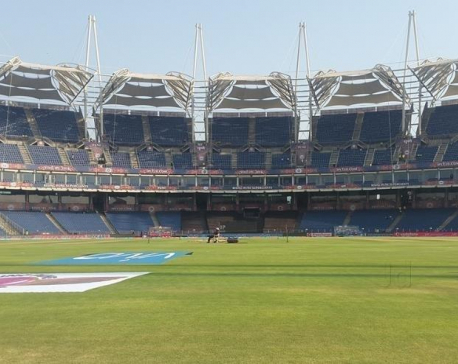 KATHMANDU, Oct 25: Pune pitch curator Pandurang Salgaonkar has been caught on camera talking to India Today reporters disguised as bookies revealing the pitch will be made according to their demands. 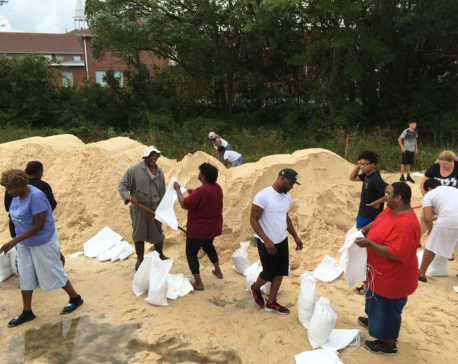 NEW ORLEANS, Oct 8: Hurricane Nate came ashore on a sparsely populated area at the mouth of the Mississippi River on Saturday and closed in on Mississippi, pelting the central Gulf Coast region with strong winds and heavy rains. 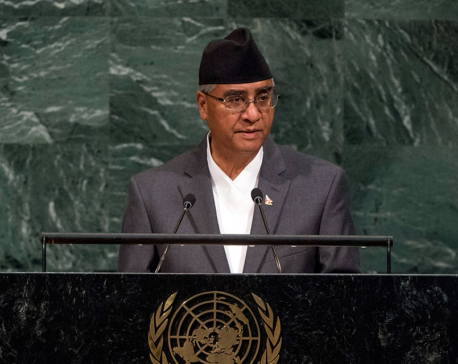 NEW YORK, Sept 23: Prime Minister Sher Bahadur Deuba has said that the global community faces a more complex and polarized environment with multiple transnational challenges ranging from terrorism, climate change, energy deficiency, food insecurity and mass migration to extremism. 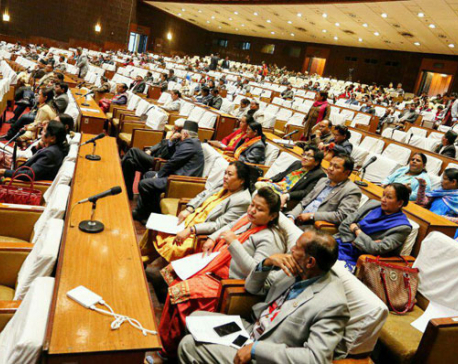 KATHMANDU, August 21: The meeting of the Legislature Parliament held on Monday evening could not endorse the Bill relating to the second amendment to the Constitution of Nepal, 2073. 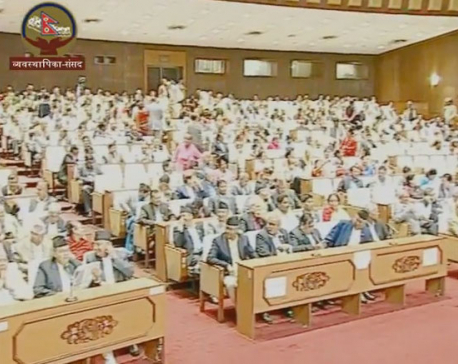 KATHMANDU, Aug 16: The Constitution Amendment Bill (second amendment)-2073 is being tabled in the Legislature-Parliament today. KATHMANDU, Aug 13: No agreement could be reached between the government and the representatives of Dr Govinda KC even on Sunday, the 21st day of the 11th fast-unto-death being staged by Dr KC. Dr KC's representatives have blamed government negligence for the continuation of the status quo. 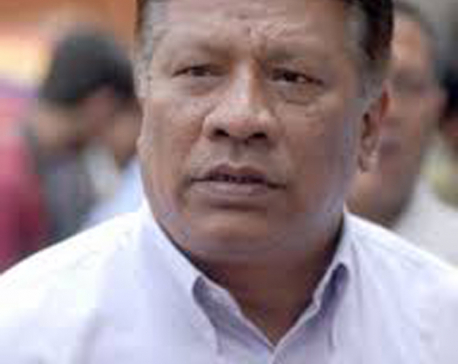 KATHMANDU, July 29: Nepali Congress leader Prakash Man Singh has said the party was restricted to the second position in the local-level elections as it failed to function as per the party statute and effectively as well. 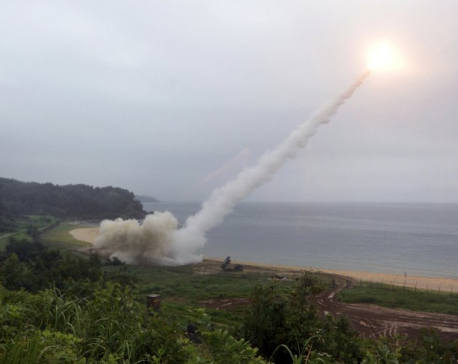 PYONGYANG, July 29: North Korean leader Kim Jong Un said Saturday the second flight test of an intercontinental ballistic missile demonstrated his country can hit the U.S. mainland, hours after the launch left analysts concluding that a wide swath of the United States, including Los Angeles and Chicago, is now in range of North Korean weapons. KATHMANDU, July 19: Ruling Nepali Congress has called a central committee meeting (CC) to review the first and second phase of local elections. 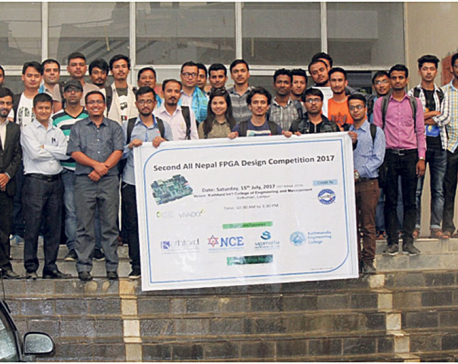 KATHMANDU: With the main objective of promoting and enhancing hardware design skills with a chip technology called Field Programmable Gate Array (FPGA), the ‘Second All Nepal FPGA Design Competition 2017’ has come to an end on Saturday at Kathford Int’l College of Engineering and Management, Balkumari, Lalitpur. 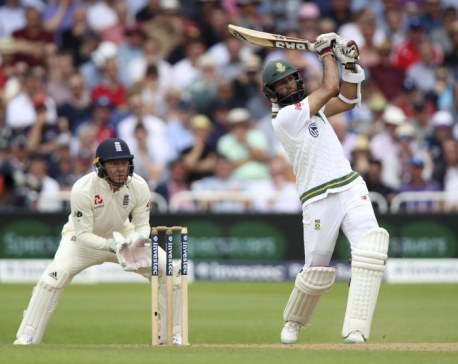 NOTTINGHAM, July 16: South Africa pushed its lead over England to 290 in the second test on Sunday despite losing two wickets in two overs just before lunch. 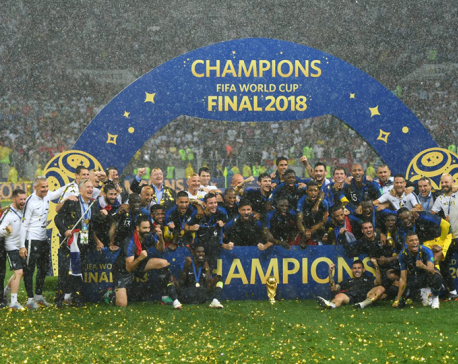 SYDNEY, July 15: Arsenal made it two wins in three nights in Sydney with a 3-1 victory on Saturday over the A-League's Western Sydney Wanderers. NOTTINGHAM, England, July 14: Returning South Africa captain Faf du Plessis won the toss and chose to bat first in the second test against England on Friday. 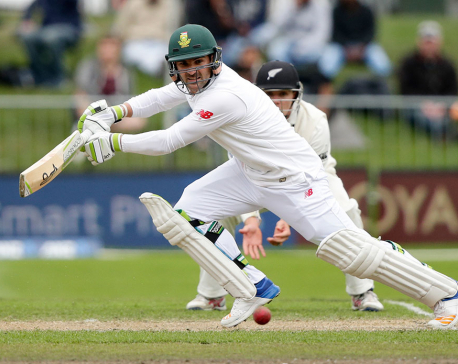 NOTTINGHAM, July 14: Returning South Africa captain Faf du Plessis won the toss and chose to bat first in the second test against England on Friday. 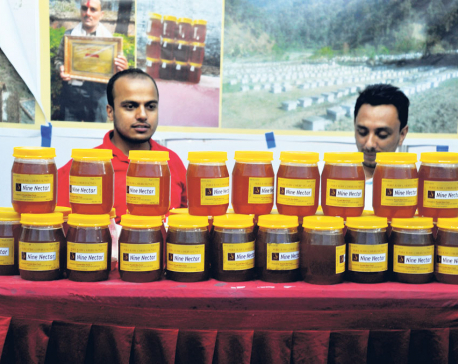 KATHMANDU, July 10: The 2nd National Honey Fair started at the Bhrikuti Mandap Exhibition Hall in Kathmandu from Monday. WARSAW, Poland, July 10: Authorities in eastern Poland say that a second World War II bomb has been found during road works, a day after thousands of people were temporarily evacuated to allow for the removal of the first bomb. 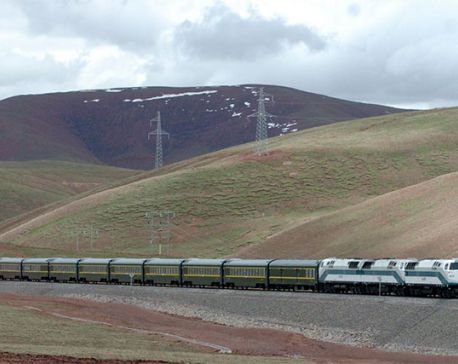 BEIJING, July 5: Work is underway on China's second railway line to Tibet that will wind through some of the world's most mountainous and inhospitable territory and likely take the better part of a decade to complete, state media said Wednesday. 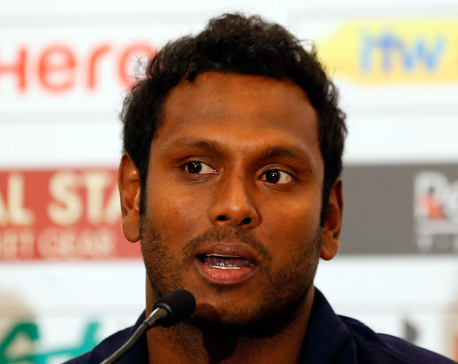 GALLE, Sri Lanka, July 2: Spinner Lakshan Sandakan took four wickets and his partner Hasaranga de Silva took a hat-trick on debut as Sri Lanka thrashed Zimbabwe by seven wickets in the second one-day international to level the five-match series 1-1 on Sunday. 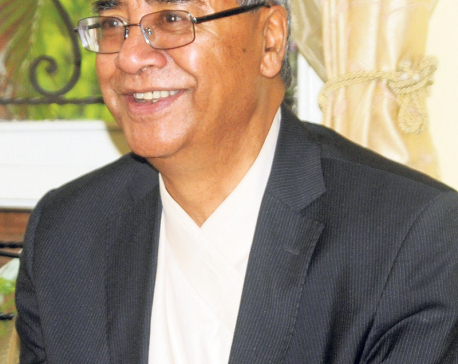 KATHMANDU, June 29: Nepali Congress President and Prime Minister of Nepal Sher Bahadur Deuba has thanked all the Nepali people for taking part in the second round of local level elections in an enthusiastic manner. KATHMANDU, June 28: The vote casting in the second phase of local elections has concluded in a peaceful manner on Wednesday. 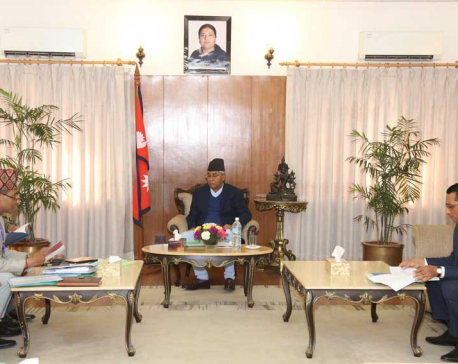 KATHMANDU, June 16: Rastriya Janata Party Nepal (RJPN) has said that it would not take part in the second round of elections scheduled for June 28. 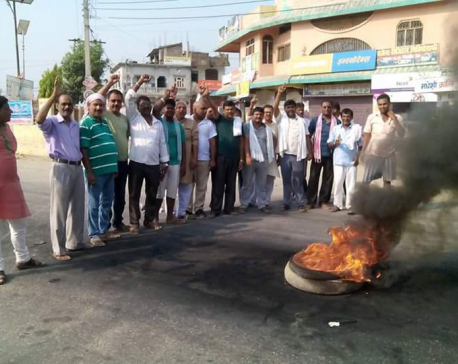 RAUTAHAT, June 14: The four-day bandha announced by Rastriya Janata Party Nepal (RJPN) has brought life to a grinding halt on the second consecutive day in Rautahat district.